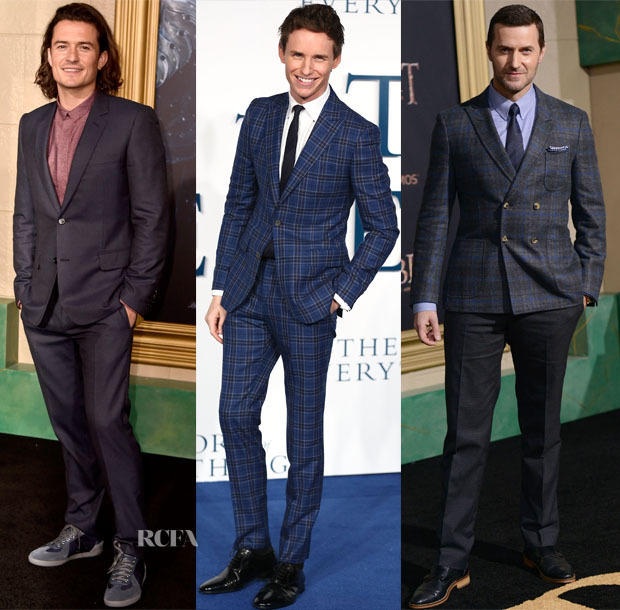 Here is a quick roundup of a few fine gentlemen who took to the red carpet on Tuesday night (December 9). Orlando Bloom: Joining Evangeline Lilly on the red carpet for the LA premiere of ‘The Hobbit: The Battle Of The Five Armies’, the actor went for a smart-casual Dior Homme navy wool two-button notch-lapel suit styled with a red cotton, small collar, graphic jacquard print shirt and smart sneakers. Was the look too casual? Eddie Redmayne: Eddie joined Felicity Jones on the red carpet for the London premiere of ‘The Theory Of Everything’. Decked out in a very smart Hardy Amies plaid suit, the actor, as always, goes above and beyond when it comes to red carpet dressing. He has worn many a great suit on the red carpet, but this one is for his hall of fame. Richard Armitage: Also taking to the red carpet for the ‘Hobbit’ premiere, the actor opted to revamp his classic style with a double-breasted, peaked-lapel plaid blazer. This marvellous piece was paired with dark grey trousers, not opting to go all the way like Eddie. Should he have, or do you like Richard’s take on modern suiting?